We’ve already had a thread about strange buildings from Soviet era. Today we’ve got another piece of strange architecture, now from modern Russia. That’s a building made in the form of giant bar code, the same bar code we see on all the goods in a supermarket. It seems to be an office building made of modules. It’s from St. Petersburg, Russia, and was submitted by Jolq, would somebody be able to read the barcode? it doesn’t mean anything. It has the wrong check digit [last number should be a 6] and if you change it to ‘6’ it’s unknown. Where in Petersburg is this? 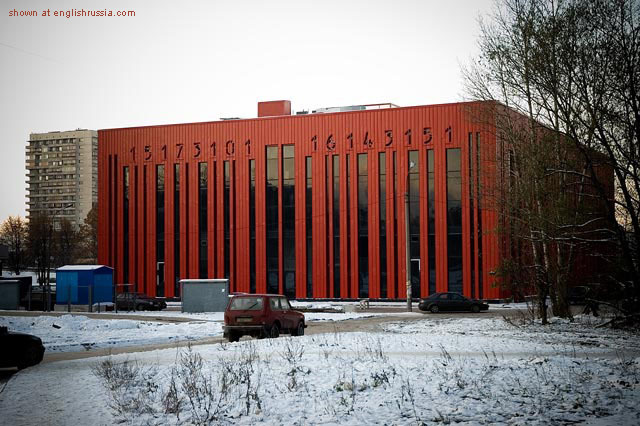 Maybe this is the building of Art Lebedev Studio, as the barcode is part of their logo ? This building is about 100m from my home 🙂 Funny to see it here. It really took me a time to understand what thouse numbers mean! Nice design, but wrong place for that (grandmos around don’t get it). It’s still under counstruction, but as I know it’s gonna be a simple trade center with usual dress shops and etc. It would make more sense if the building was white. Not far from there is an Institute called “Bonch”, somebody should post pictures of that crazy building. That’s pretty cool. Why are you calling this architecture strange? There is absolutely nothing strange about it? Фил, it’s near Volodarsky bridge at right side of Neva. So, if I read the code with a barcode reader, I can add the building to my shopping cart? (Please check, I may have a bit or two wrong.) This might stand for something. Enjoy. hey fancy doing some of my classless subnetting jobs? If you have a barcode reader of THAT size, you can clearly afford it. That is so cool that I wanna take off my nuts (cashews that is…did you think it was something else?) and arrange them in random order so that they look like the barcode illustrated above.